irzounek has been a member since November 13th 2011, and has created 5 posts from scratch. NaamKyun.com proudly presents a very special guest article written by Grand Master Lam Chun Chung and his disciple Vincent Liu. 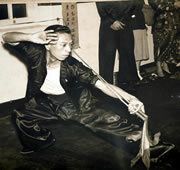 Techniques are demonstrated by Grand Master Lam Chun Sing. Lam Cho Daai Si (1910-2012): Grand Master of Southern Shaolin Hung Ga Kyun, the Man, the Legend. It has been one year since he left us, and we miss him a lot, every day. NaamKyun.com wants to pay the respect to the late Grand Master and brings you an extensive biography of Lam Cho Daai Si, written by Lam Sai Wing’s student Wong Man Kai published in 1951. Special thanks to Fan Kwoen of Kung Fu Utrecht for providing the translation. How would you describe Hap Gar to newbie/pro? For the newbie: Hap Gar is a martial art from Southern China with roots in the Tibetan systems. It is characterised by ‘long arm’ movements in which strikes are thrown in wide arcs, generating a lot of force. The routines are very beautiful to watch- often mimicking the movements of the white crane with its wings and beak. In Canton, the style has won many competitions for performance. Also the large movements and stances means that it is an excellent form of exercise literally using every part of the body, developing cardiovascular fitness, flexibility and strength. The movements have been well and truly ‘battle tested’ and have been proven to work well for real combat. 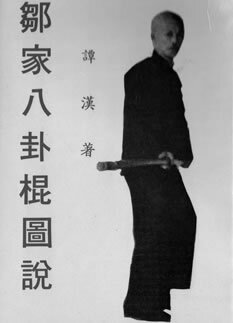 Taam Hom Sifu, Grand Master of “Taam Family Three Extensions System” (Taam Ga Saam Jin Kyun, one of the Siulam/”old Hung Kyun” systems ) was known in Hong Kong as “Long Pole King” (Gwan Wong). His famous long pole skill comes from Jau Family (鄒, ie. not Jau 周 of commonly known Hung Tau Choi Mei). 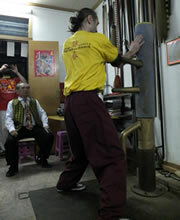 A few days ago expedition of sifu Rzounek Ivan and his kung fu school returned from studying in China. 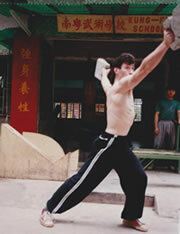 Sifu Ivan Rzounek went to China for the first time in 1993 and since then regularly go there to learn, every year, sometimes for several months. The last five years has been to study Baan Fung Siu Ching Chung Wing Chun (and Choi Lei Fat, Hung Kyun …) under the guidance of an experienced teacher, Leung Wai Choi sifu.